At September 30, 2017. 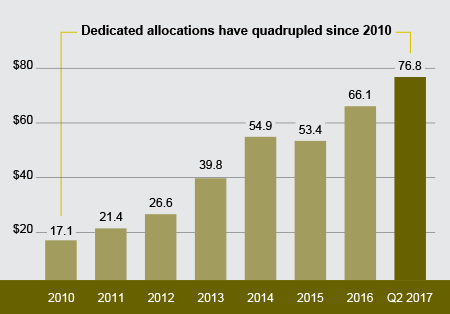 Source: Morningstar Direct, Cohen & Steers. The information presented above does not reflect the performance of any fund or account managed or serviced by Cohen & Steers. Standard deviation is a statistical measure of volatility. Sharpe ratio measures the efficiency of returns, represented here as total return divided by standard deviation. Upside/downside capture represents the average proportional return relative to the broad market in months of positive/negative performance, respectively. 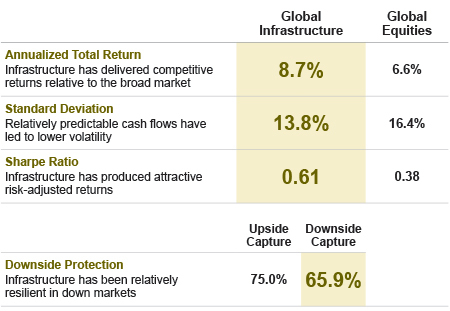 (a) Dow Jones Brookfield Global Infrastructure Index inception date. See below for index associations, definitions and additional disclosures. At September 30, 2017. Source: Cohen & Steers. At September 30, 2017. 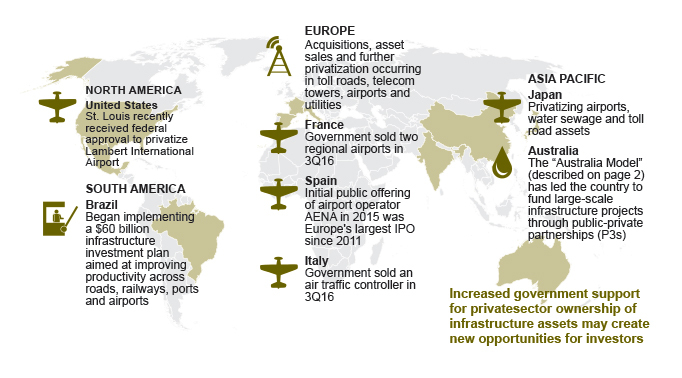 Source: Preqin, Goldman Sachs, Cohen & Steers. There is no guarantee that any historical trend illustrated above will be repeated in the future, and there is no way to predict precisely when such a trend will begin. See below for additional disclosures. 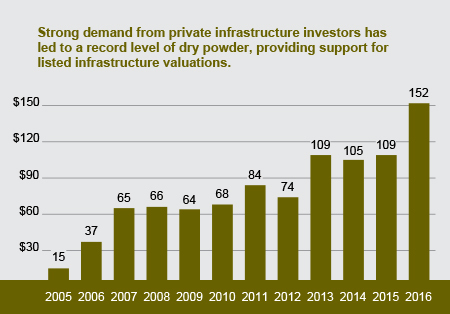 (a) Dry powder is the amount of capital that has been committed to a private equity fund minus the amount that has been called by the general partner for investment. Sachs, Bloomberg, company reports and Cohen & Steers. EV/EBITDA refers to the ratio of enterprise value to earnings before interest, taxes, depreciation, and amortization using current fiscal year estimates. See below for additional disclosures. 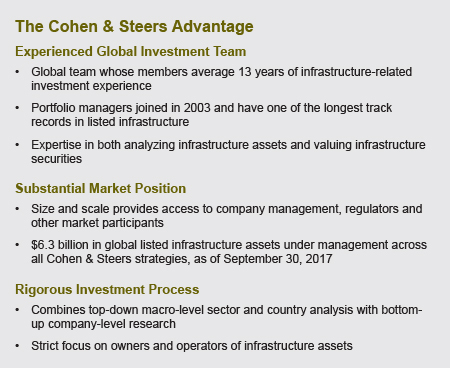 Cohen & Steers U.S.-registered open-end funds are distributed by Cohen & Steers Securities, LLC, and are available to U.S. residents only. Cohen & Steers Capital Management, Inc., (Cohen & Steers) is a registered investment advisory firm that provides investment management services to corporate retirement, public and union retirement plans, endowments, foundations and mutual funds. Cohen & Steers UK Limited is authorized and regulated by the Financial Conduct Authority (FRN 458459). Cohen & Steers Japan, LLC, is a registered financial instruments operator (investment advisory and agency business with the Financial Services Agency of Japan and the Kanto Local Finance Bureau No. 2857) and is a member of the Japan Investment Advisers Association.